The renovation and reopening of the stately Southern mansion, the Blue Ridge Madam, is about to shake things up in the tiny town of Walls of Water, North Carolina…. Willa Jackson is enjoying the peace of working in her small shop on the outskirts of town and avoiding the rich families, the townies. The Blue Ridge Madam belonged to her family in the 1930s but an adverse economy changed that. Willa is fascinated by the old home but still feels a sense of unease about her own past role as the Walls of Water High School Joker. Colin Osgood has his own concerns about returning to Walls of Water and is only here for the renovation that his sister, socialite Paxton Osgood, is determined to complete. Meanwhile, the previously flamboyant teenager Sebastian Rogers has returned to the town as a much more sedate adult- a dentist! Can such a group of unlikely people find common ground? Will the secrets long held by the Blue Ridge Madam help Willa, Colin, Paxton, and Sebastian learn the magic of friendship and love? 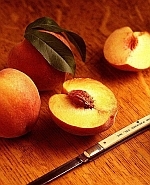 Sarah Addison Allen’s stories are always a bit magical and THE PEACH KEEPER is no exception. There are bells that ring on their own accord, a floating fedora, and the haunting smell of peaches that all weave their way into the tale. However, the real magic of the story is the value of true friendship and how it can survive even the oddest and worst of circumstances. I love watching how each of the characters begins to see their childhood memories through an adult lens and realize some of both the superficiality and heroism of their daily lives. It’s an amazing journey, and the kind of story that Sarah Addison tells quite well. THE PEACH KEEPER is a light hearted story on the surface, but the deeper meaning underlying the tale is what makes it all the more memorable. Sarah Addison Allen has a gift at capturing the quintessential heart of the South and expressing it through magical realism. While THE PEACH KEEPER is not a part of any series, fans of Allen’s GARDEN SPELLS will appreciate the brief appearance by Claire Waverley. What a beautiful, lyrical tale! Highly recommended!